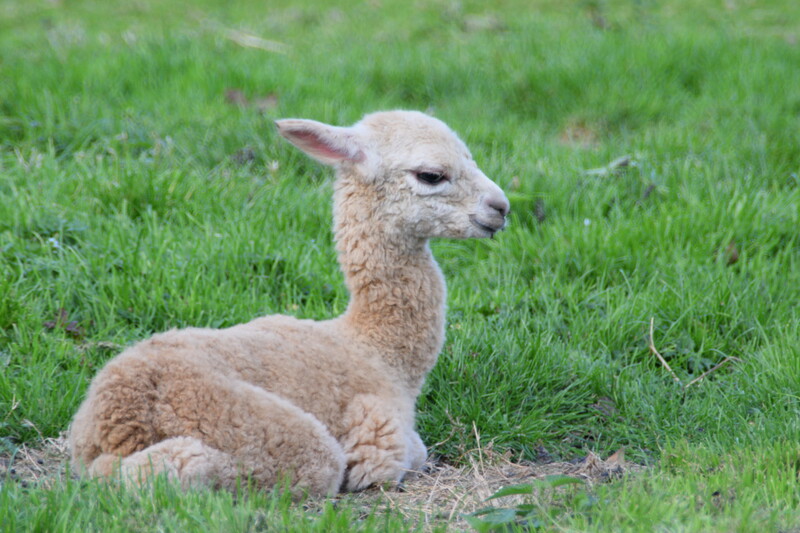 Willow is our newest baby alpaca or ‘cria’, here at Tilgate Nature Centre. She was born on the 2nd October. Our keepers were well aware that Coco the alpaca was pregnant, but Willow still came as quite a surprise – the whole birth took less than ten minutes. There are often complications in alpaca births, but our keepers checked her over and found her to be in rude health! It was obvious that Willow was a strong little one even then, Crias can usually stand about half an hour after birth, but Willow was up in just fifteen minutes! We watched her take her first few tentative steps – her legs splaying out awkwardly as she tested them – and it wasn’t long until she was gambolling around her paddock! She had a little bit of trouble learning to suckle, but Coco was patient and Willow soon got her first taste of milk. Willow is very adventurous, already ranging far and wide. But no matter how far she explores, she always comes back to Coco. Crias suckle their mother’s milk until they are six months old. Until then, mum is never too far away. We think she’s just adorable! Why not come and see her for yourself?